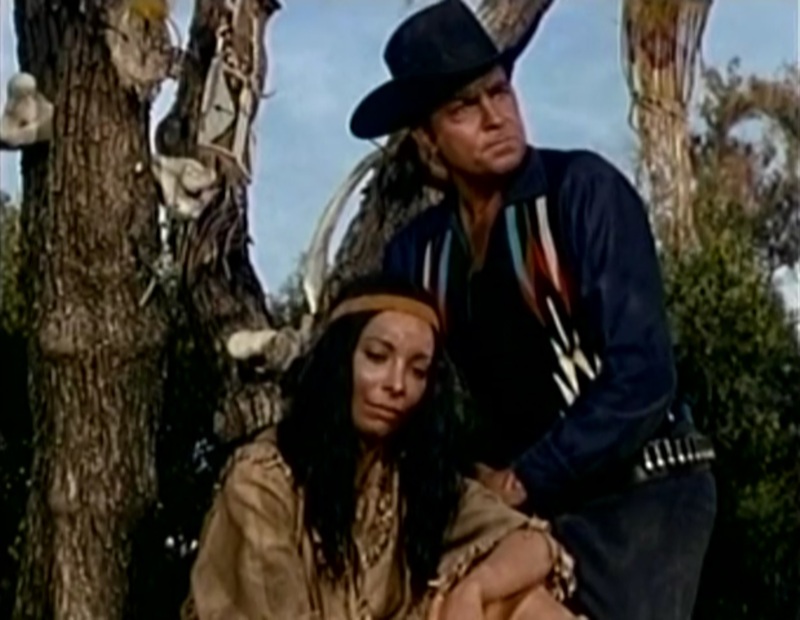 The woman, Noshima (Arlene Martel), manages to escape after Calhoun shoots one of the men, but she does so on Calhoun’s horse. He quickly gives chase and catches up to her. The two of them spend the rest of the episode together, learning about one another and dispelling the fears they have about each other’s people. For instance they discuss the killing of buffalo for sport by the white man, as well as the human blood on each of their people’s hands. I’ve seen a fair amount of western films, but I haven’t seen a lot of western TV from the ’60s. What I have seen (in both mediums), I don’t remember being this frank or open with the issues at hand. Fuller’s own Run of the Arrow definitely comes to mind, but in the more mainstream films it’s a lot of the standard “Cowboys and Indians” stuff. 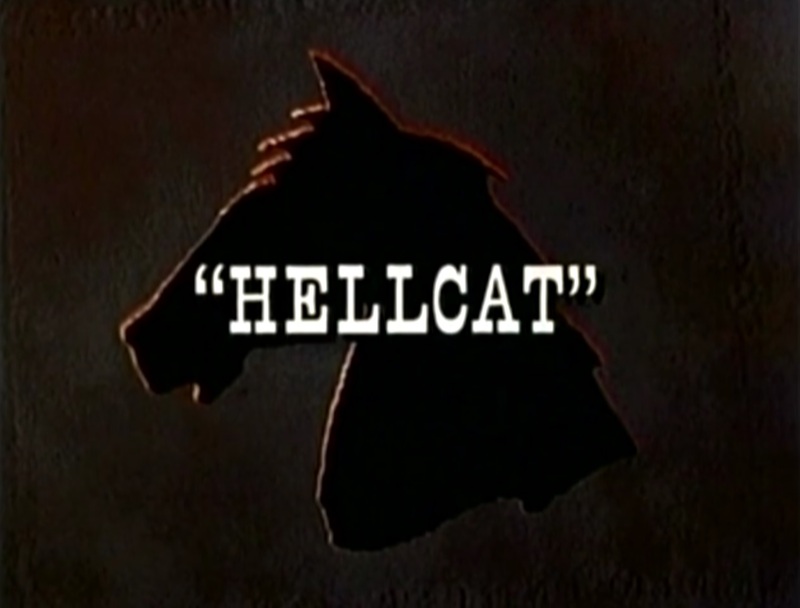 In Hellcat, Fuller presents the Native American culture as something unique and worth examining, even including scenes that involve Native American mysticism. Calhoun is definitely shown as skeptical of this, but he says nothing, and through the course of events it is implied that Noshima’s faith in these practices has saved her life. While I’m sure this depiction is an over-simplification of a broad and nuanced culture, it’s a welcome and unexpected change of pace. Overall, Hellcat is a more successful episode than Fuller’s written memory gives it credit for. It does feel somewhat padded out to fill the hour-long time slot, but it is definitely the most interesting of the Iron Horse episodes I’ve seen yet. Based on the episode title, I had fairly high expectations for Volcano Wagon… which is probably why it was one of the worst Iron Horse episodes yet. Nearly everything about the story felt contrived and ridiculous, and there was very little in the way of Fuller’s style or influence. Volcano Wagon opens with Barnabas (Robert Random) calling out for a kid named Georgy (Tommy Durkin). The BPS&D is currently camped at the base of a mountain to construct a tunnel, and right at this moment they’re preparing to set off a huge keg of dynamite just inside the tunnel. Barnabas finally spots Georgy and he’s skipping — skipping!!!! — into the tunnel (and presumably his death). Barnabas calls for O’Brien and Nils to go in after Georgy, the dynamite blows, and now all three of them are stuck behind a huge pile of rubble. You’d think a kid living in the Old West would have better sense than to just skip head-first into a literal powder-keg situation, but good ol’ Georgy thinks with dumb movie logic so he is blissfully unaware. In order to get them out, Calhoun and Barnabas must head to a nearby town where they know some nitro glycerin is being stored. 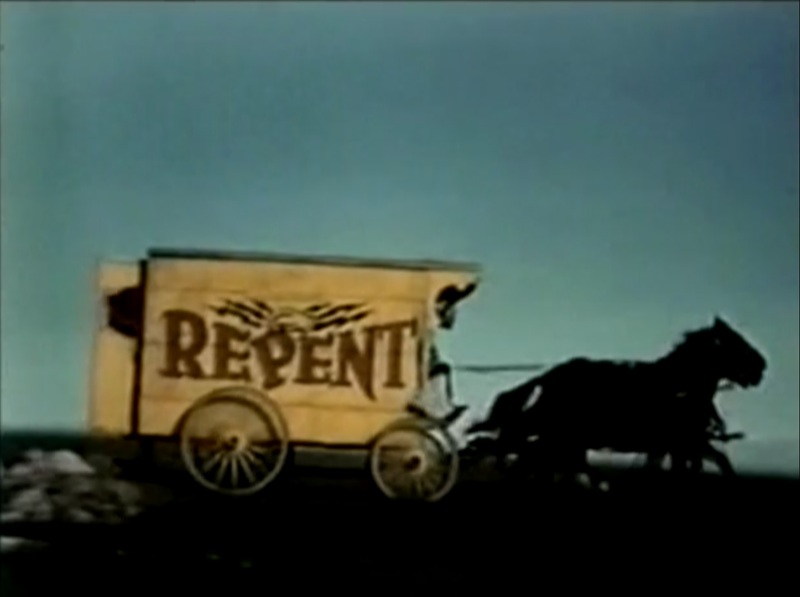 In the town they run into a fiery preacher who asks them to repent because the nitro is apparently representative of the damnation that God will deliver to the sinners of the world. The people of the town drank the preacher’s Jesus Juice, too, because instead of trying to help Calhoun get the nitro safely back to the cave-in, they actively sabotage him! The sheriff refuses to allow the nitro on the train because it passes through a few towns on the way, and the train could explode and take the towns with it. Huh? Isn’t the train the safest and smoothest method? No, a rickety wagon across dirt roads is clearly the better option! Big thanks also go out to the guy who sold them the wagon, for unscrewing one of the caps holding a wagon wheel on, making the journey that much more dangerous. The preacher has a daughter and as you might expect, she has been brought up under the sheltered wing of the word of God. She develops feelings for Barnabas over the course of the episode, but she’s scared to venture into unknown territory. While I was watching this all seemed unrelated to the struggle at hand, but it later dawned on me that she was the polar opposite to little Georgy who started off this whole mess. His parents weren’t watching him at all, and clearly didn’t shelter him enough so that he would learn to avoid the about-to-explode tunnel. The world is a scary place, filled with danger, and it should be feared and respected. But when done to extreme it becomes irrational and ridiculous. I’m not sure the writers intended this little buried life lesson, but it’s the only explanation I have for the way the story plays out. In any case, for all its damnation and explosions, Volcano Wagon was a dud.